Tiffany Iris Corsage Brooch Set With Montanna Sapphires. © The Walters Art Museum. While most are familiar with the exotic beauty and rarity of Kashmir and Ceylon sapphires, the state of Montana is home to some of the most beautiful sapphires in the world. The most famous mine is the Yogo Gulch deposit in central Montana, known for the vivid color and clarity of its sapphires that are mined directly from a lamprophyre host rock. The other well-known deposits are the Missouri River, Dry Cottonwood Creek, and Rock Creek; all secondary, alluvial deposits yielding stones of various fancy colors. Corundum had first been discovered in Montana around 1865 as a byproduct of gold mining. These sapphires, found along the Missouri River near Helena Montana, were characteristically small in size and came in a wide range and depth of color. 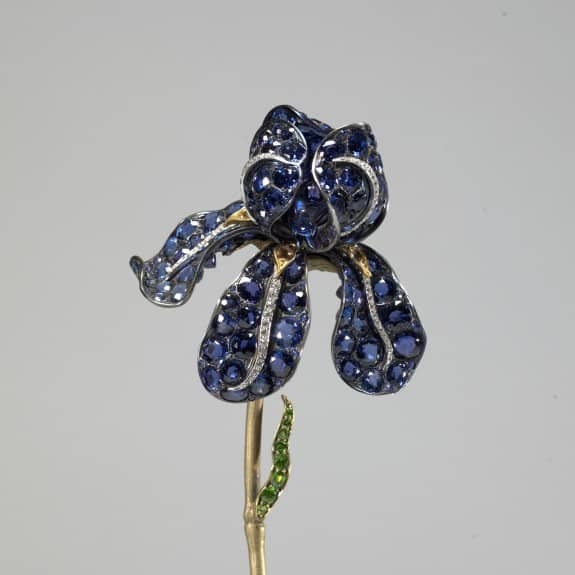 American jewelers found the sapphires held patriotic appeal and were particularly well suited for use in the popular crescent and circular pin designs of the era. Over the next one hundred years, the Yogo deposit produced over 18 million carats of sapphires, of which an estimated 2.55 million were of gem quality. During the height of production in the early 1900s, the deposit was the most valuable gem resource in the United States. Economics and weather have halted production intermittently over the years and the deposit has passed through a number of different mining concerns. An American firm is currently conducting commercial mining but the limited size of Montana sapphires (fewer than 10% are over one carat in size) and the cost of mining directly from the host rock keep mining costs relatively expensive. Voynick, Stephen M. Yogo: The Great American Sapphire. Missoula, MT: Mountain Press Publishing, 1987.